Top 5 Acts You Cannot Miss at Art Outside — Sobre Sound "
Described as 1 of 7 “Next-Gen Festivals You Need To Know” by Buzzfeed, Art Outside is in its 11 year and bigger than ever. The list of musical acts, artists, dancers and other performers is extensive and quite impressive. This “2.0” fall festival northwest of Austin (past Hutto & Taylor) is an example of festivals taking a queue from characteristics of established fests like Coachella, Bonnaroo. Art Outside expands on ideas to develop a destination weekend that’s more than just about the music. 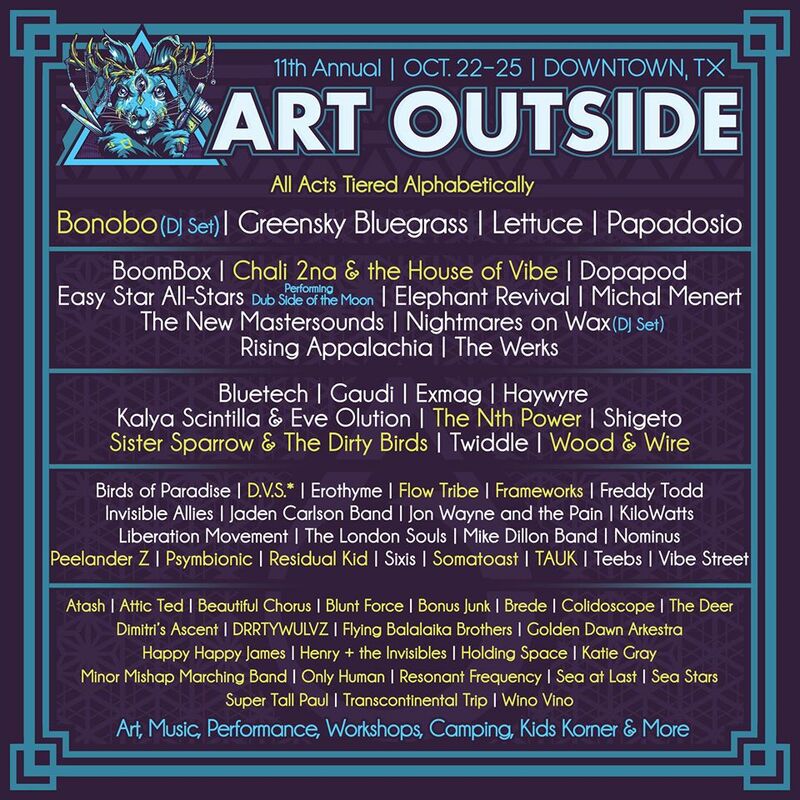 By offering workshops, yoga classes, film screenings and variety of performance art, these new festivals like Art Outside deliver a full sensory experience that strives to differentiate itself from ACL and FunFest. Even thought there is plenty to see and do at #AO2015, these five musical acts are performances you cannot miss. Space Hindus from the 5th Element banded together to bring the cosmic funk to Earth. I recently had the pleasure of catching Golden Dawn Arkestra in a live performance in San Antonio at K23 Gallery and I was blown away. Members of the band parted the audience to form a tunnel of humanity that acted as a portal to welcome the (upwards to) 12-piece multiverse-Parliament. We need to invent a new term similar to “hype-man” because those not playing an instrument provided more than hype, it was galactic promulgation. There was an old grey haired man with a bone on his head dancing to the rhythm, a woman with a blue wig carrying an incense burner that looked like a teapot with a bellows on the back, and there was a short Asian woman with a smile bigger than the futuristic goggles she was wearing, the stage presence was larger than life. With a horn section, vibraphone, guitars, drums, synthesizers, conga and a whole lot of dancing going on, it was amazing for Golden Dawn Arkestra to remain so tight and in step with one another. Golden Dawn Arkestra is a band YOU CANNOT MISS at Art Outside. They perform Saturday, Oct 24 at 9 p.m. on the Midway Stage. Take all the sounds you’re nostalgically fond of as an 80's baby and arrange them over a collage of electro beats and you might be close to understanding the allure of Shigeto. The freeform feel of the beat construction and jazz-like song structures create a magnetic and interesting array of sounds that can be listened to in solitude or out in the club. Once a drummer for School of Seven Bells, this Ghostly artists’ sound can be described as IDM or ambient post-dubstep. Think Burial meets Flying Lotus, while there are elements of hip-hop, the tracks are more related to techno or something like an 8bit-heavy, melodic Aphex Twin. Shigeto performs on the Main Stage Sunday night at 8 p.m.
From Austin TX, this trio of teenagers got an early start and met at a songwriting workshop at a youth camp. Residual Kid consists of guitarist/vocalist Deven Ivy, brothers Ben and Max Redman and are all under 18 years of age. You can hear various influences in their brand of alt-rock like early Nirvana and classics like Black Sabbath. In Residual Kid’s “Pulling Through”, the vocal sounds very reminiscent of “War Pigs” and the guitar riff has classic rock all over it. Residual Kid’s spectacular ascent has been highlighted by tours in the US and Europe, recording with J Mascis, working with a Grammy-nominated producer as well as playing large-scale festivals such as ACL, Way Out West Fest and even Pukklepop in Belgium. Last year, they inked a record deal with Sire Records to record and release their first major label EP. They’re currently still in the mixing & mastering phase and the album is expected to be out before 2016. If “songs” were the type of sound arrangement you can hum to and sing a long with, the type of music Teebs makes is the difference between a painting and sculpture. Both painting and sculpting are of the visual arts, yet exist in different worlds where they require a completely separate skill set to complete. Teebs’ track construction are soundscapes that are at times song-like but have an ASMR quality that soothes the soul. Teebs is part of Flying Lotus’ record label BRAINFEEDER and the two were actually neighbors at one point and has worked with Prefuse 73, Daedelus and others over the last few years. Teebs will be performing at Art Outside’s Dome Stage Friday evening at 6:30 p.m. The legend. A classic. And all the way from Leeds, England, Nightmares On Wax has been at it since at least the late 80s and early 90s. Originally founded by George Evelyn and Kevin Harper at a time when they were all about the break dance scene in their hometown. Harper eventually left to pursue his own DJ career a few albums later but the project turned from DJ-focused to constructing original tracks written with the help of contributing musicians and live analogue instruments. The Ibiza veteran also known as “the granddaddy” has reinvented himself many times over the years and has adapted to the evolutions of dance music over time. NoW’s music has spanned genres like trip-hop to big room and has worked with many artists such as DJ Shadow, LFO, and even German composer/arranger Sebastian Studnitzky. Nightmares on Wax is scheduled to be performing a DJ set on Art Outside’s Dome Stage Friday night at 11:30 p.m.